Christopher is an undergraduate student in the College of Arts and Humanities studying Vocal Performance. He is an active volunteer and during his time at Fresno State has worked closely with Camp Kesem, a nonprofit organization that sends children to a free week of summer camp whose parents have been affected by cancer. He has also worked with Feeding America, which is the philanthropy of his fraternity Lambda Chi Alpha. 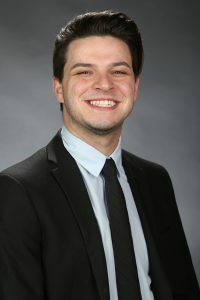 Christopher hopes to improve parking and safety on campus by listening to the student’s concerns and urges them to join him through student committees on ASI, and reaching out to him via email or phone. He is excited to work closely with the students and hopes for a productive and safe school year!